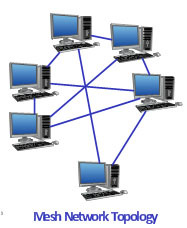 In mesh topology all the systems or computer are connected to each other with many redundant connections. Traffic is carried out only between two system in which one will be sender and another will be receiver. It provides multiple path for data transferring in network. 1: Partial Mesh Topology : In partial mesh topology some of the networks are connected to all computers and some are connected to only those computers which with they most frequently exchange information . 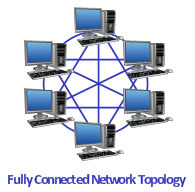 2: Full Mesh Topology : Each and every node or computer or systems are connected to each other. Every system is fully connected . Communication or data transfer is very fast . Most Reliable as if any link breakdown rest link will work perfectly and communication will take place among all except break link. Each connection can carry its own data so no performance issue. Provide Security & Privacy . No traffic congestion problem as dedicated links are being used . Network expansion is not easy task as new computer will connected each computer. Cabling cost will be more than any one else network topology . Bulk Wiring is required .